Moving to Singapore for a new Job. I will be moving to Singapore for a new Job at New Horizons Computer Learning Center Singapore. New Horizons is the world’s largest IT training company with 300 locations in 70 countries. As a global company, we provide comprehensive programs for individuals looking to expand their IT skills, or looking to take the first step toward new careers. New Horizons work with enterprises and government agencies, including Fortune 500 companies all over the world, to best maximize their IT investment and increase productivity. AI Game Programming for Beginners. 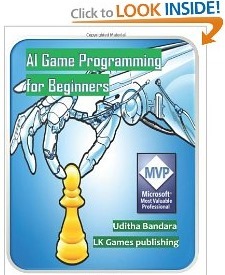 I had written this print and e-book about AI Game Programming for Beginners. Path finding is about finding the best path to the destination. This chapter focus in Breadth-First, Best-First, and A* (A-Star) pathfinding algorithms. * Breadth-First. * Best-First. * A* (A-Star). 2. Implementing pathfinding in XNA. * Creating realistic enemy movement sample. Chase and Evade AI behavior can be used in situations like enemy AI implementations. Wandering AI can be used for AI based characters in virtual worlds. 1. Chase and evade algorithm. *One object turn toward another object (Chase). *One object turn away from another object (Evade). 2. Wandering AI algorithm. 3. Implementing chase, evade and wander AI in XNA. * Cat, Mouse and Dog objects behaving for Chase, Evade and Wander. Aiming can be useful to create projectile based enemy AI shooting. Algorithm will decide best suitable gun projection. * One 2d object aim toward another object for spotlights, guns etc. 2. Implementing Aiming in XNA. * Aiming for enemy object by using a spotlight. RTS games use waypoint navigation to follow orders in moving units. It could be linear behavior for enemy units or steering behavior for vehicles. 1. Linear and steering waypoint algorithm. * Object following specific path that provided by the user. 2. Implementing waypoint algorithm in XNA. * RTS units (both human and vehicle objects) following orders to go on the specify path. Flocking AI model can be used for collective animal behaviors of birds, fish, insects etc. Separation, Alignment and Cohesion are key properties of flocking AI behavior. 1. Flocking algorithm with separation, Alignment and Cohesion. * Set of objects formation to create similar behavior. 2. Implementing flocking in XNA. * Creating both birds and insects flocking behaviors sample.